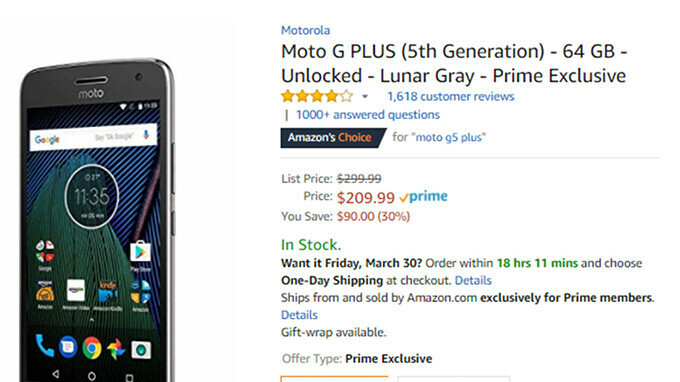 Amazon is running a sale on its own version of Moto G5 Plus 64GB. Although it does come unlocked, the Prime Exclusive Moto G5 Plus features pre-installed Amazon apps such as Amazon Widget, Prime Music, Prime Photos and others. These Amazon apps can't be uninstalled, so make sure you're ok with having a bit of bloatware on your phone before buying a Prime Exclusive model. If that doesn't bother you, you'll be pleased to know the Moto G5 Plus is now available for just $210, so you'll be saving $90 from the MSRP, according to Amazon. The unlocked Moto G5 Plus is fully compatible with all major US carriers, including AT&T, Sprint, T-Mobile, and Verizon Wireless. However, the discounted phone is only available in Lunar Gray, not the Fine Gold too. If you're not sure whether or not to take Amazon's deal, we strongly recommend reading our full Moto G5 Plus review to learn more about what the phone has to offer.